Love, greed and betrayal in the Las Vegas mob. 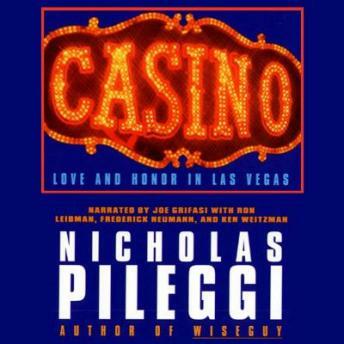 From Nicholas Pileggi, author of the bestselling Wiseguy -- the #1 bestseller that later became the hit movie Goodfellas -- comes this brilliantly told tale of love, marriage, adultery, murder and revenge Mafia-style, the true story of how the mob finally lost its stranglehold over the multi-billion-dollar casino gambling industry of Las Vegas. No one knew more about casinos than Frank 'Lefty' Rosenthal, the gambling mastermind who, with his best friend and partner Anthony Spilotro virtually ran Las Vegas for the mob. For years it was the perfect arrangement -- Lefty provided the smarts and obsessive attention to detail, while Tony made sure the bosses stayed happy with their weekly suitcases filled with millions of dollars in skimmed cash. It was so sweet it should have lasted forever, but Lefty's obsession with running the town -- and Tony's obsession with Lefty's beautiful showgirl wife Geri -- eventually led to the betrayals and investigations that exploded into one of the greatest debacles in the mob's history. A real-life story of love and betrayal set in America's favorite playground, Casino is a Mafia tragedy of Shakespearean dimensions, as well as the inside account of just how the mob lost control of the neon money-making machine it created. Great book. Very well put together. Great stories and very much valid information.